A U.S. diplomatic representative to COMESA was confident about the upcoming establishment of COMESA customs union, saying it would help African nations, especially members of the bloc, revive in the global economic crisis. "COMESA's launch of customs union will help the African nations rebound through the impacts of the global economic downturn," said Mikael Cleverley on the sideline of the ninth COMESA meeting of foreign ministers on Friday. The talks which mainly focused on security issues in the bloc was the last preparatory one for the two-day summit of the Common Market for Eastern and Southern Africa (COMESA) in which the long-anticipated customs union will be officially set up for the African largest trading bloc. Cleverly, also first secretary for political and economic affairs of U.S. embassy to Zambia, said African countries have been under different impacts from the downturn as some have showed some resistance to the impacts while others were quite exposed to the crisis as other parts of the world. "The customs union is a very important step in economic integration as it will lead to more economic activities between COMESA members and step up the trade competitiveness of the private sector in the bloc," the U.S. diplomat told Xinhua in an exclusive interview. "That will not only make the COMESA members bounce back in economics but also build themselves up to be stronger to instability in the future," he added, highlighting the significance of the coming development of COMESA. Cleverly admitted that the launch which should take place this month will be the first stage as more works need to be done. The diplomat, nevertheless, stressed that necessary functions of the COMESA would be put in lace by the customs union towards reaching the goal of imposing common external tariffs on exports from outside the bloc. "We have seen how the members of the EU benefit from that integration and I expect Africa will benefit as well," Cleverly said. He cited the cost as one of the striking difficulties to do business in Africa. "For instance, the transport cost has impaired their competitiveness. The launch of the customs union will help reduce the cost of transferring goods from one state to another. I think that will render assistance to the private sector and consumers in Africa." Cleverly said one industry to benefit will be the agricultural sector, given the growing demand for food globally and the potential of increased productivity in the region. The diplomat also hailed the development of the cooperation between the United States and COMESA since the two sides signed a trade investment framework agreement in 2001. COMESA was established in December 1994 to replace the former Preferential Trade Area for Eastern and Southern Africa (PTA) which had existed from the earlier days of 1981. With headquarters in the Zambian capital of Lusaka, COMESA enjoys an aggregate population of about 400 million and combined GDP of over 360 billion U.S. dollars. It comprises Burundi, the Comoros, the Democratic Republic of Congo, Djibouti, Egypt, Eritrea, Ethiopia, Kenya, Libya, Madagascar, Malawi, Mauritius, Rwanda, Seychelles, Sudan, Swaziland, Uganda, Zambia and Zimbabwe. 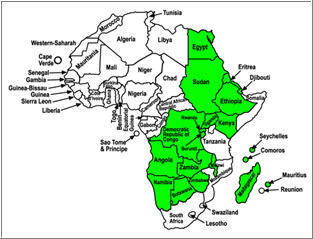 The 19-member bloc established the first free trading area in Africa in 2000.